The #1 introduction to mass communication text, Media & Culture: Mass Communication in a Digital Age, is at the forefront of the ever-changing world of this dynamic course, addressing the most current issues of our time—including the proliferation of fake news, the #metoo movement, the use and abuse of social media platforms, consumer privacy, and the role media plays in our democracy. The Twelfth Edition of Media & Culture digs deeper than ever before into the worldwide reach and ethical implications of today’s media by highlighting global issues, such as foreign interference in social media and the effect of international box office revenue on decisions made by the domestic film industry,and ethical considerations, such as the fight against sexual harassment across the media industries and the coverage of recent mass shootings, throughout each chapter. This is an exciting and tumultuous time in the media. 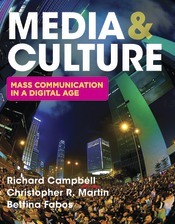 Developing an understanding of mass communication and becoming a critical consumer of the media is vitally important, especially now as the media are under siege and the lines between fact and fiction are being continuously blurred. Media & Culture reaches students where they are and puts the media industries into perspective historically and culturally, helping them to become more informed citizens who use critical thinking and media literacy skills in their daily lives, even as they are bombarded by information, in a variety of ways and via a variety of media. The Twelfth Edition of Media & Culture digs deeper than ever before into the worldwide reach and ethical implications of today’s media by highlighting global issues, such as foreign interference in social media; augmented reality gaming around the world; the effect of international box office revenue on decisions made by the domestic film industry; newspaper and television consumption around the globe; China’s dominant media corporations; new bias around the globe; and international media research; and ethical considerations such as the coverage of recent mass shootings; #MeToo and the fight against sexual harassment across the media industries; gender problems in digital gaming; breaking through Hollywood’s race barrier; contemporary politics reviving interest in classic novels; and public relations and "alternative facts".